Demand for packaged food products is decreasing in France, England, Spain, Italy, Germany and the Netherlands as the offer is abundant and the competition strong. The gates of Russia, that had presented an opportunity for packaged food products over recent years, have closed. Africa, by comparison, has become a potential market for packaged food products. Steady growth unaffected by the last financial crisis, a growing middle class, the lack of a food processing sector, more stable political conditions, a surge in modern distribution and limited competition all contribute to the current favourable position in Africa. China and India account for about 25% of imports of food products in Africa; Portugal exports 8% of its transformed food production; approximately 7% of the turnover of western food companies such as Unilever and Kraft derives from Africa. 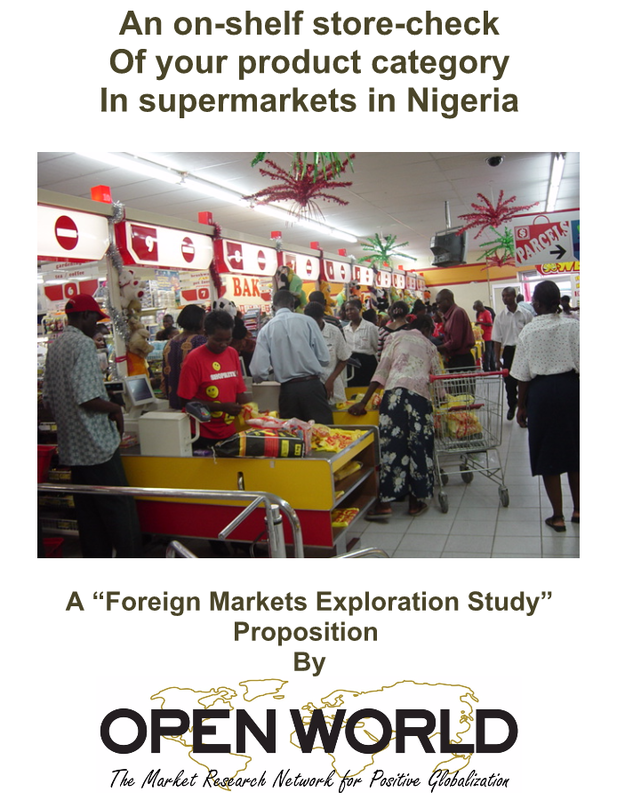 Open World « the Market Research Network for Positive Globalization » that continuously conducts consumer tests and studies in Western Europe, the Americas, Eastern Europe and Asia, recommends that you identify what products in your category are present in Nigeria thanks to a “store check” in the largest hypermarket in Nigeria (7,000 m2 , open in 2005 in Lagos: see appendix). Thanks to its Nigerian Partner: « Realities Research Nigeria Limited ». This very affordable study will give you valuable insights in to the products within your category and the opportunity to explore further if Nigeria holds potential for your products.
. Income spread, size of the middle class.
. Structure of the distribution, share of modern distribution.
. Name and localisation of supermarkets.
. Size of the shelf-space of products in your category (for instance: what is the length of frozen packaged products).
. Sub-categories present in the shop (example: samosas, spring rolls, fish filets) and sub-categories that are not represented (but that might).
. Brands and products on-shelf: format, price.
. We will dispatch you two packs of the three most important competitor brands, so that you can see their features and establish if your product would compete successfully. The technique of this exploratory study is the « store-check ». It consists of sending a project leader of our Nigerian Open World partner to the Shoprite hypermarket. The project leader photographs all of the shelf related to your product and any sub-categories (with their size). He/she pinpoints each product on the shelf: brand, format and price. He/she will then buy the three most important products within your category and then dispatch them to you. If this proposition is of interest, please contact your national Open World Partner or the Open Air president, to brief him in detail about your specific request. He will be your only partner in regard of this store check in Nigeria. The cost of this store check is of 3.500€ including dispatching the packs of the three leading brands. Any additional pack would be invoiced at 100€ each. If you believe that Nigeria represents an opportunity for your products, based on the store check, we can then help you further explore the potential of the Nigerian market. If your product proves to be better than the existing ones and if your packaging has sufficient appeal relative to the current alternatives, it would be a pivotal argument for distributors. We would then submit your packaged food product (with its scores) to the eight supermarket brands, in order to measure their willingness to reference your product on their shelves. A Nigerian lawyer would the assist you in the drawing up of the contract with the chains that would be ready to sell your product. We stay available for setting up this store check.